Last Saturday night, 17th November 2018, representatives from Drumhowan Community and Killanny CPR Group, accompanied by Monaghan County Council’s Leas Cathaoirleach, Cllr. 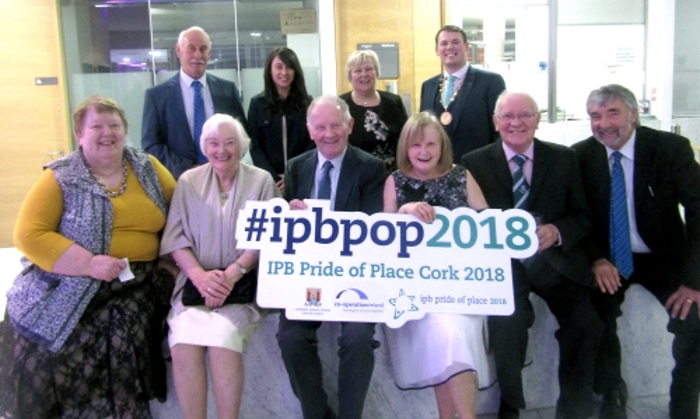 Colm Carthy and Development Officer, Carol Lambe, made their way to Cork City Hall to join over eight hundred of Ireland’s brightest and best community leaders at the Gala Awards for the All Ireland IPB Pride of Place competition. The competition acknowledges the work that communities are doing all over the island of Ireland, and seeks to recognise the voluntary effort that often goes unrewarded, but which is so essential to making a community a great place to live. The competition focus is about people coming together to shape, change and improve daily lives in their communities. Communities are nominated to represent their local authority area by their local Council. There are a number of categories, with communities of similar size competing in five population-based categories, followed by a number of theme-based categories, covering issues which make a difference to the quality of life in an area, such as ‘Wellbeing Initiative’, ‘Creative Place Initiative’, and ‘Community Tourism Initiative’. Drumhowan represented Co. Monaghan in the 300-1000 population category, while Killanny CPR group proudly competed in the Community Wellbeing Initiative category. Adjudication took place back in September, when two judges spent three hours in each of the communities, visiting the area and talking both to the committee to gain an understanding of the work that had been achieved, and to the people of the area to hear the impact the work of the group is having. The two categories the Co. Monaghan entries were competing in saw the largest entries in the competition, and were hotly contested, with the Co. Monaghan entrants losing out on this occasion. The winner in Drumhowan’s category was Balla, Co. Mayo, of which the judges said “It is rarely that the judges visit a place where virtually everybody encountered is on cue regarding sustained co-operative effort and what it takes to maintain a sustainable community” – high praise indeed. The winner in the Community Wellbeing Initiative category was the Gary Kelly Cancer Support Centre in Drogheda. 2018 was the 16th year of this annual competition, described as the ‘Oscars of the Community Sector’, which celebrates the often unsung work of community groups that selflessly work to make local neighbourhoods a better place to live in, work in or visit. Organised by Co-Operation Ireland and sponsored by IPB Insurance, the Pride of Place awards sees the country’s local authorities, on both sides of the border, nominate outstanding projects that contribute to civic pride. Speaking at the awards last Saturday, Lord Mayor of Cork, Cllr. Mick Finn said: “Cork has a strong tradition of volunteerism and community action and we are delighted to be partners in the Pride of Place competition. The Gala Awards evening is a unique opportunity to celebrate the best in community development and recognises the invaluable efforts of those who glue our communities together”. Tom Dowling, Chairperson of Pride of Place, expressed his delight “that after 16 years the competition continues to embed itself in the very heart of the Island of Ireland’s communities and gives them the opportunity to highlight the proud and amazing achievements of their place directly to the judges. I wish them continued success and we are all looking forward to meeting all the nominated groups for a great night in the wonderful exciting city of Cork”. Peter Sheridan, Chief Executive of Co-operation Ireland said: “Pride of Place deserves its position as one of the most prestigious community awards on the island of Ireland and Co-operation Ireland is delighted that it continues to go from strength to strength. ← Stand Up Awareness Week is taking place from November 12th-16th, 2018.